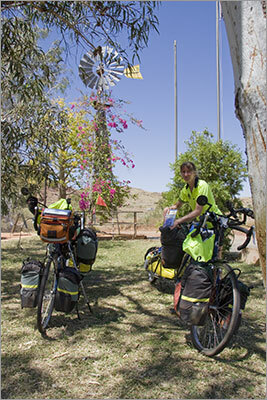 A short ride today to Karratha and a two night stop. For most of the way we had a weak tail wind, which was a nice alternative to the previous few days. As we turned off the West Coastal Highway we rode into the wind - :-(. But it was also a rather nervous ride for me as drivers of oncoming cars would raise their hands to wave I would find myself pulling to the left in anticipation of something being thrown our way. I suspect it will take a while to get over yesterday’s experience.